I had never thought that I would have to face corruption issues. 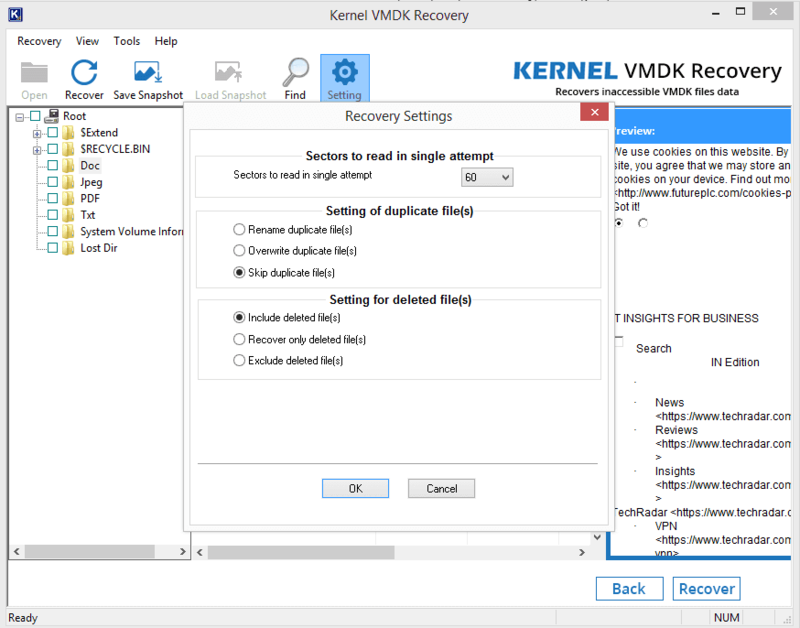 Luckily, Kernel VMDK Recovery tool easily recovered all my files." I tried this tool and recovered all my VMDK file content. We had many reports saved in the file, and thankfully all were securely retrieved. I am delighted with the performance of this tool as it handled even large VMDK files after corruption. It instantly brought all data back. 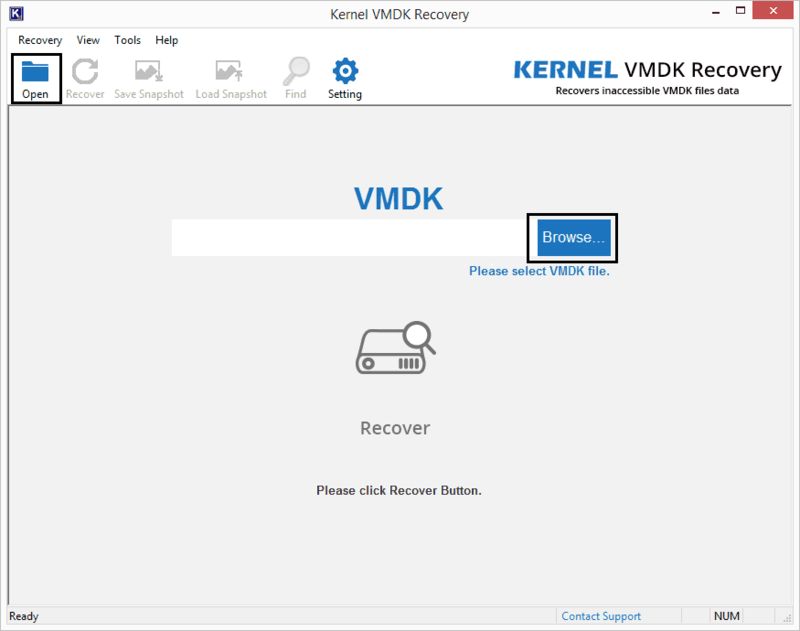 Kernel VMDK Recovery tool supports the recovery of all types of VMDK files including those of VMware Workstation and VirtualBox. So, you can recover the entire data (media files, emails, documents, database files, etc.). After retrieving the VMDK file content, the tool displays it in a tree structure. 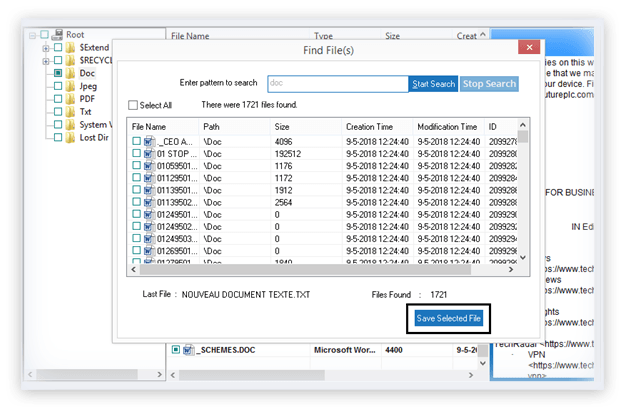 If you want to search for a specific file type, you can use the ‘Find’ option of the tool. It searches the VMDK file and lists all the files of the specified type. The preview feature of the tool lets you see the content of VMDK file before saving. 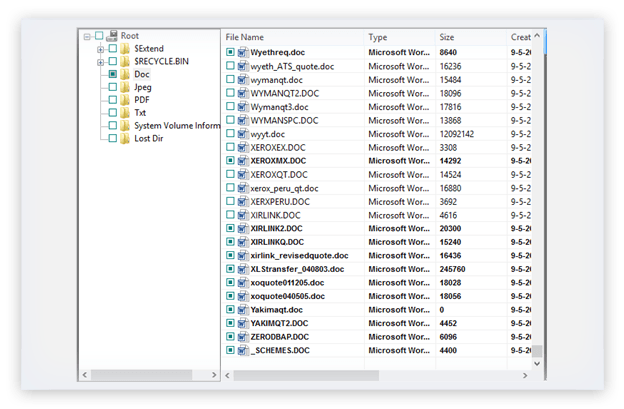 You can select any folder in the VMDK file and see its files on the preview pane. After recovering the data, you can choose to save data at the desired location on your system. After saving the data, the software will display a confirmation message too. The tool has a unique snapshot feature which lets you save the scanning procedure. Later you can reload the saved snapshot to continue the recovery process. This feature eliminates the need for rerunning the recovery process. The tool allows you to specify the number of sectors to be read on a single scan. 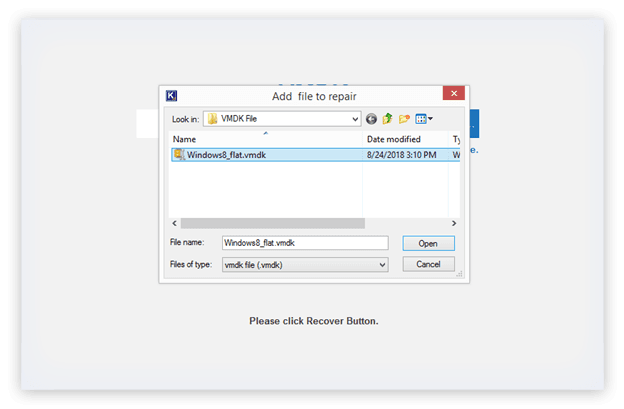 Also, You can rename, skip, overwrite, include, or exclude duplicate/deleted files at the time of VMDK recovery. 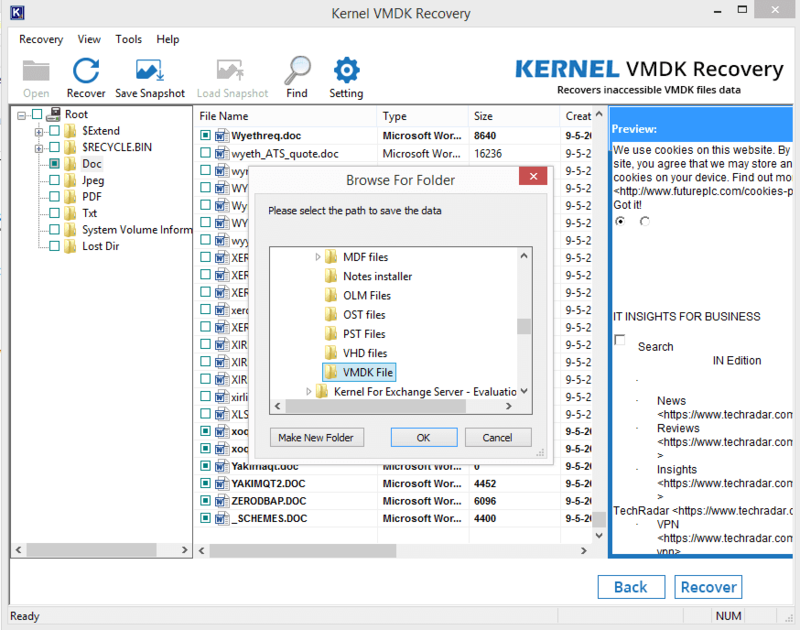 Recovering files from VMDK container is quite simple with the help of VMDK Recovery software. 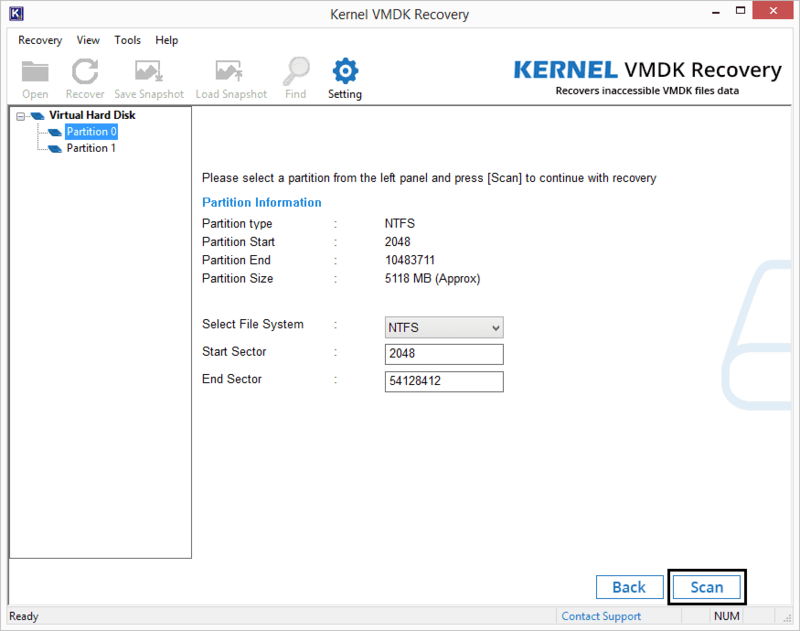 It accesses the VMDK recovery, scans it, and retrieves all the corrupt files from it. To save yourself from scanning multiple times, you can save a snapshot and use it later. 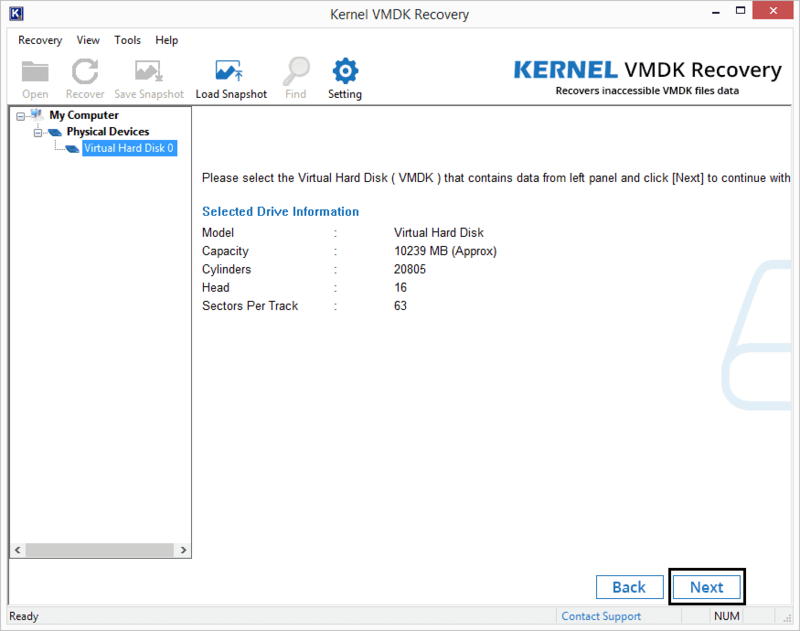 Here are the simple steps you need to follow for VMDK Recovery. 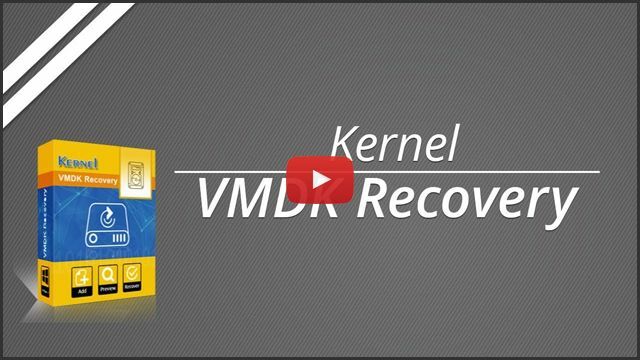 How can I recover a VMDK file using Kernel VMDK Recovery tool? Which types of virtual machine platforms do use VMDK Files? What are various types of errors which a VMDK file shows when it is corrupt? Can I preview files(s) after the scan completion? Yes, upon selection of each specific file a detailed preview will be shown on-screen. Can I save the recovered data using the trial version of the software? Yes. 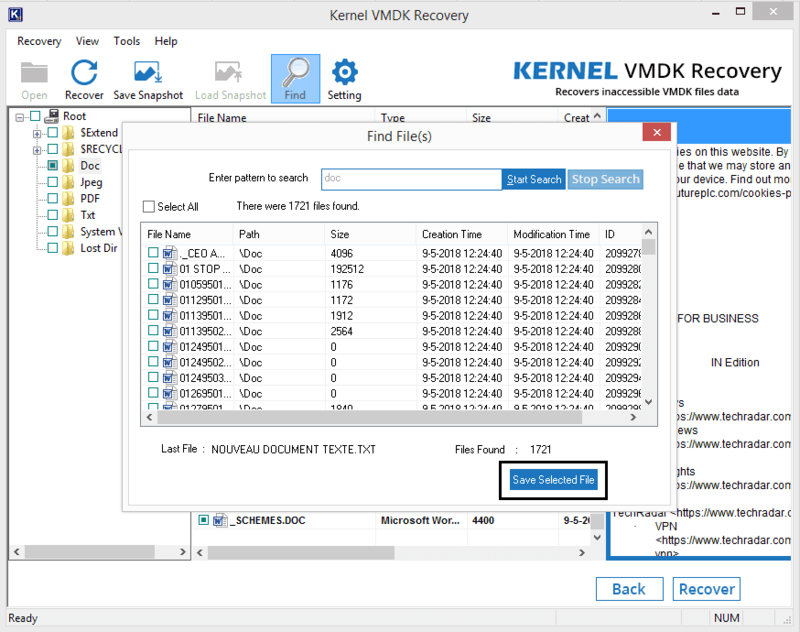 You can save up to 250 MB of the recovered VMDK file data using the trial version of the software. Will the recovered file(s) be explicit and original? 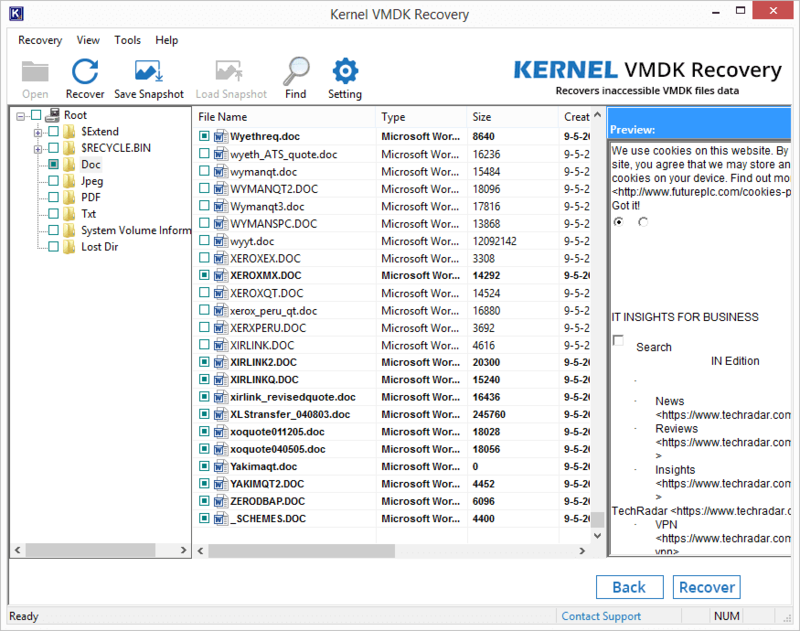 All file(s) restored will be as explicit & original as they as were before, VMDK Recovery tool maintains the file structure & hierarchy. 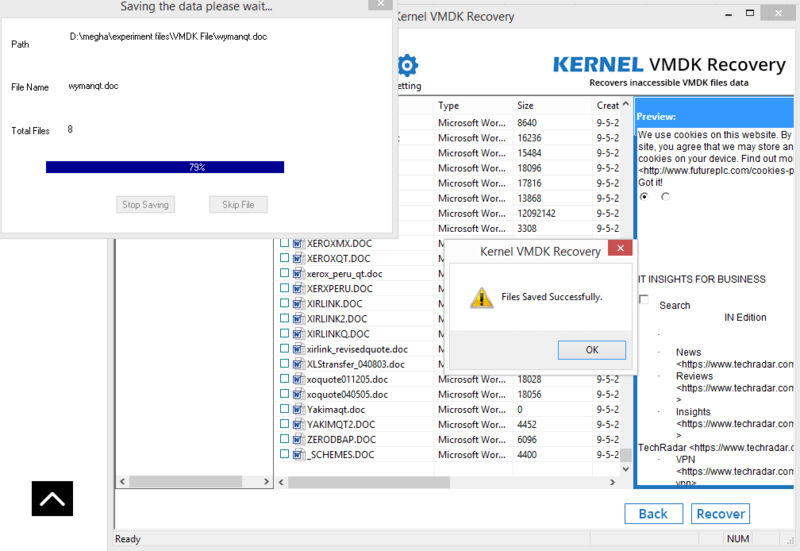 Is there any size limit for a VMDK file before recovery? The software does not have any size limitation for VMDK file. You can select VMDK files of any size. Will the tool work on the latest build of Microsoft Windows 10? Yes, Kernel Recovery tools are extensively compatible with Windows ecosystem, we accumulate our Recovery tools with recurring updates. 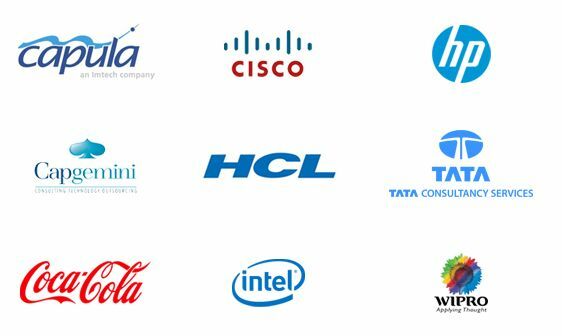 How long will it take to deliver the Product License? Upon successful purchase, Product activation credentials will be delivered shortly via registered email to the customer. Selecting a Virtual Hard Disk to recover files. 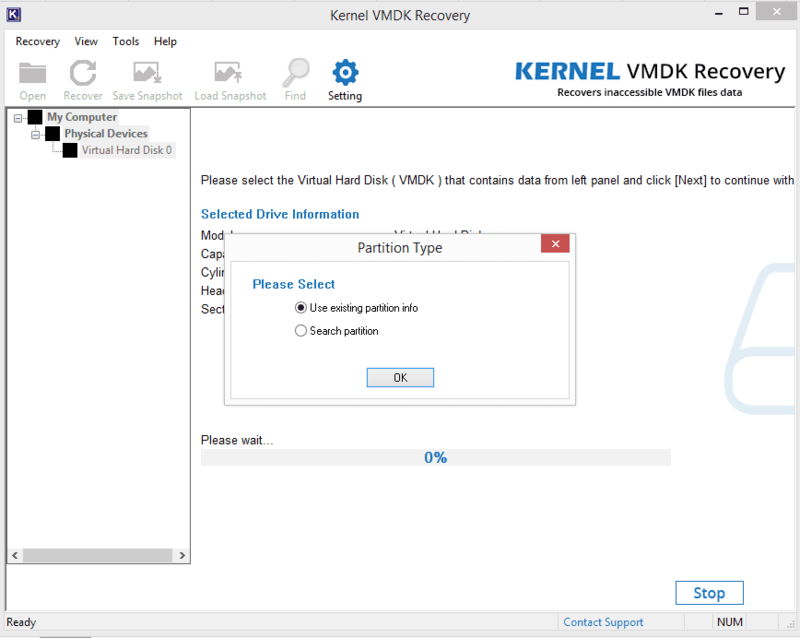 Selecting the partition for recovering VMDK files. Recovered VMDK data is displayed for preview. Recovery settings in the software. Saving data at the desired location. Few step procedures for saving my large-sized file is really amazing. Powerful software. "Had a great experience using this software. Also one can rely on other to run this tool as it is quite easy to run." I thoroughly enjoyed the performance of software which has attractive user interface and requires minimum inputs from the user.